Michael Norton (of Harvard Business School) and Dan Ariely (of Duke) have released results (pdf) from a series of experiments they did in 2005 on the subject of wealth inequality. They asked individuals in a nationally representative online panel to (1) estimate the current US distribution of wealth and (2) “build a better America” by describing what they thought would be the “ideal” wealth distribution. 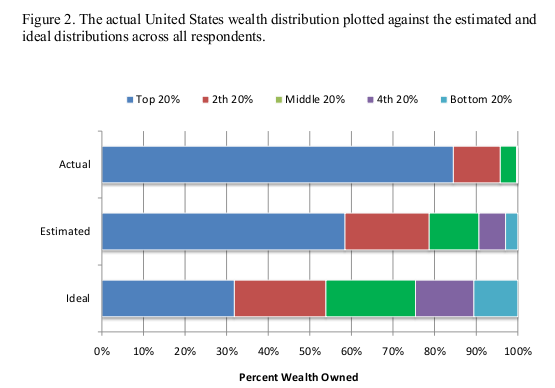 First, respondents dramatically underestimated the current level of wealth inequality. Second, respondents constructed ideal wealth distributions that were far more equitable than even their erroneously low estimates of the actual distribution. Most important from a policy perspective, we observed a surprising level of consensus: All demographic groups – even those not usually associated with wealth redistribution such as Republicans and the wealthy – desired a more equal distribution of wealth than the status quo. Even those respondents who voted for George W. Bush look like they’re far to the left of “actually existing capitalism.” In the actual distribution, the top fifth holds over 80 percent of all wealth in the United States. On average, Bush voters estimated that the true share was close to, but not quite 60 percent. Ideally, however, Bush voters believed the top 20 percent should have about 35 percent of all wealth (for Kerry voters, it was about 30 percent). This piece is crossposted with John Schmitt's blog, No Apparent Motive.